One of the most important concerns in pediatric dentistry is the loss of necrotic primary molars, leading to space loss. Although the morphology of root canals in primary teeth renders endodontic treatment difficult,,, pulpectomy of primary teeth with severe pulpal involvement should be considered as a treatment of choice. The success of pulpectomy depends on elimination of irritants by means of cleaning and shaping the root canal. The primary objectives of cleaning and shaping the root canal system are removing soft and hard tissue containing bacteria, providing a path for irrigants to the apical third, supplying space for medicaments and subsequent obturation, retaining the integrity of radicular structure. The nature of canal dimensions, shape, and curves as well as the physical properties of instruments prevents the possibility of a uniform, tapered, flowing preparation. Canal shaping is relatively easy in straight roots but has always been challenging, demanding a high skill, when performed in curved roots. Many complications such as ledging, apical perforation, and mid-root strip perforation may affect the long-term success of treatment as it fails to eliminate infection of the root canal system and hence making the obturation more difficult. Various instrumentation techniques and instruments have been introduced in an attempt to reduce these problems aiming to provide the optimum-shaped preparation. The development of new design features such as varying tapers, noncutting safety tips, and varying length of cutting blades has resulted in a new generation of instruments. According to the manufacturers, the V-Taper ™ rotary system is a series of three variable taper NiTi rotary files. With this system, most molar and premolar root canal preparation can be completed using 2–3 files and anterior root canals using 1–2 files. This performance-enhanced system is easier, safer, more efficient, and less expensive than any other NiTi rotary file system. With the introduction of new system in field of rotary endodontic, the study with an aim to compare and evaluate the cleaning efficacy, canal preparation, and volumetric filling using conventional files and rotary V-Taper files through cone beam computed tomography (CBCT) was carried out. For the present study, ethical clearance was obtained from the Institutional Ethical Committee of Sumandeep Vidyapeeth (Approval No. SVIEC/ON/Dent/RP/15036). The minimum requirement of sample was 28 observations per group with following assumptions. Mean difference of percentage of voids (PV) between two groups: 0.6; combined standard of deviation: 0.8; effect size: 0.75; confidence interval: 95%; power: 80%; test: two-tailed. Hence, according to the above-mentioned assumptions, 30 extracted primary molars with minimum 3 canals in each tooth (90 canals) were distributed equally in all the three groups. Thirty extracted primary molars with at least two-thirds of intact root and 7–12 mm length were included in the study [Figure 1]. Before starting, the teeth were cleaned with soap and washed in running water. Hand scalers were used to remove calculus if present on the root surface and stored in 0.5% sodium hypochlorite for 1 week. Coronal access was made with round diamond burs. After irrigation of the root canal with normal saline, a K-file with a compatible diameter was introduced into the root canal and the canal length was determined at 1 mm from the apex or root bevel. The teeth (30 teeth, 90 canals) were randomly divided into three groups. Group A (30 canals) was manually prepared with K-files up to a file size three times larger. Group B (30 canals) was instrumented with rotary V-Taper files up to a file size three times larger. Group C (30 canals) was instrumented first with K-files, followed by rotary V-Taper file in the same manner. Patency and working length of each canal were determined by passing the size #10 K-file. Sodium hypochlorite (1%) was used for irrigation through a 31-gauge needle after use of each instrument. Each root canal was irrigated with a total of 5 mL sodium hypochlorite. Canal recapitulation was performed after the use of each file. Files were regularly wiped using wet gauze to remove tissue debris. After canal preparation, root canal filling was done with zinc oxide eugenol cement using lentulospirals in all groups. 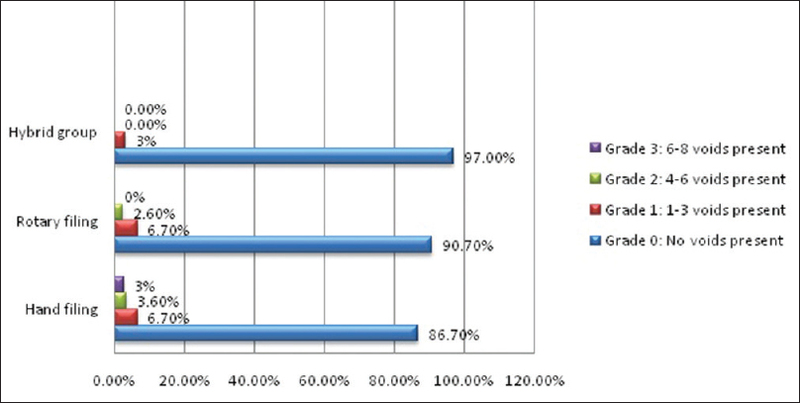 The postendodontic investigations were done with CBCT. 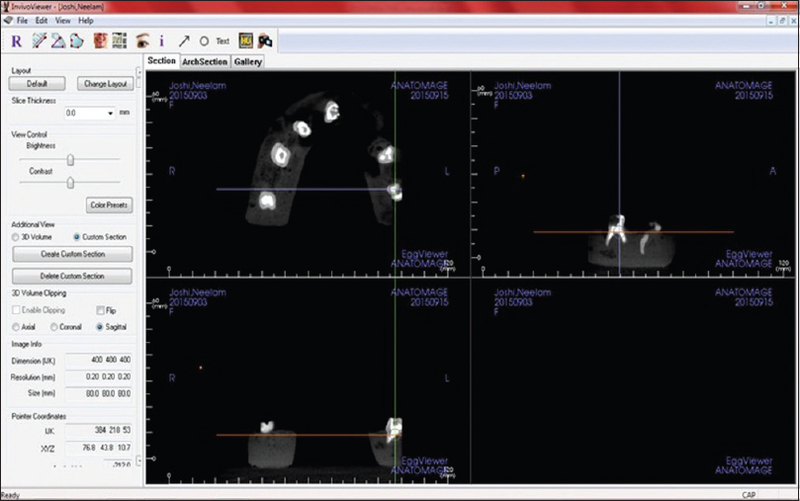 The volumetric analysis, i.e., percentage of volume (POV) of the root canal filling in primary molars, was done through CBCT software [Figure 2] and [Figure 3]. The collected data were entered in the master chart prepared on a computer using Microsoft Excel 2007, and the data were analyzed using SPSS software version 21 for descriptive test (standard deviation, coefficient of variation, mean) and independent test. Rotary files were discarded after five times of use. Infection control protocols were followed during the study, and the extracted primary molars were discarded after the completion of study following the infection control protocols. The present in vitro study was done to evaluate the cleaning efficacy and volumetric filling in primary molars using CBCT. Intragroup and intergroup comparative evaluations were done between Group A (hand filing), Group B (rotary filing), and Group C (hybrid filing) [Table 1]. 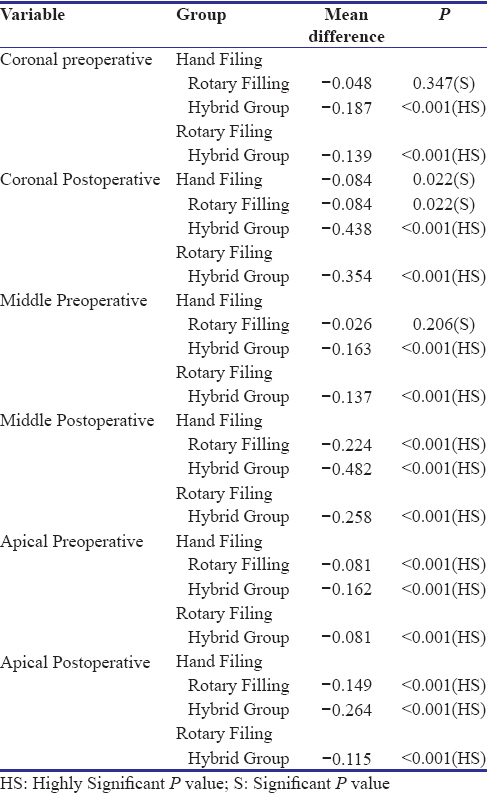 P value was found to be highly significant (<0.001) in most cases, except coronal preoperative and postoperative observation between hand and rotary filing group, and also in the middle preoperative observation between hand and rotary filing group. The quality of zinc oxide eugenol filling which is done in all the three groups, i.e., Group A (hand filing), Group B (rotary filing), and Group C (hybrid filing), is shown in [Table 2]. P value was highly significant (<0.001). Furthermore, we can appreciate that the Group C (hybrid filing) showed fully filled canal (n = 30) and Group A (hand filing) showed partially filled canal (n = 19) [Figure 4] and [Figure 5]. Volumetric filling analysis was done by considering three variables, i.e., density of filling in coronal, middle, and apical area, also by considering the number of voids present in the canal filling [Table 3]. The comparison shows that density of filling in coronal area was found to be 5262 in hand filing group and 4202 in hybrid group. Further, least number of voids was present in hybrid group (0.13) [Figure 6]. We can appreciate that hand filing group had highest number of voids and least voids were found in Group C (hybrid group) [Figure 7]. However, conventional hand instruments often failed in achieving these objectives. Most canals are curved, whereas endodontic instruments are fabricated from straight metal blanks. This results in uneven force distribution in certain contact areas and tendency of the instrument to straighten itself inside the canal. Subsequently, apical canal areas have a tendency to be over prepared toward the outer curve or the convexity of the canal, whereas more coronal areas are transported toward the concavity., Similar results were observed in our study as there was difference in canal preparation among the three groups where more dentin was removed in conventional group > hybrid group > rotary group [Table 3]. Rotary biomechanical preparation of deciduous teeth was first described by Barr et al. There are no clear guidelines for the instrumentation of primary teeth root canals with rotary files. Kuo et al. found that with the modified protocol, ProTaper Ni-Ti rotary files can be safely and efficiently used for root canal preparation in primary molars. Considering the advantages of V-Taper Ni-Ti files, we have used them in our present study. Advantages of V-Taper ™ 2 rotary files are (1) deep apical shaping with conservative coronal shaping (2) deep apical shape creates better access for irrigation and cleaning, and three-dimensional obturation, (3) variable taper design creates conservative coronal shape, hence preserves dentin, (4) 1–2 files per case, lowest cost for shaping per root canal procedure, and (5) strongest tested file system on the market. There are few studies that compare the cleaning ability of manual and rotary instrumentation in primary teeth. The current study compared the cleaning efficacy of manual instrument (K-files), rotary system (V-Taper) in the preparation of primary molar root canals. To check the cleaning efficacy and volumetric filling, comparison was done between V-taper rotary files and Hand K-files. In addition, it is evident that the hybrid technique, i.e., the use of both hand and rotary files is beneficial; this technique was also taken into consideration. Hence, the three groups decided for the study were Group A (hand filing), Group B (rotary filing), and Group C (filing with hand and rotary files.). Our study demonstrated a significant difference in the cleaning ability of rotary and hybrid filing group in coronal third (P < 0.0001), middle third (P < 0.0001), and apical third (P < 0.001) of the primary molar root canal as compared to manual instrumentation. Huang et al. and Kadhom and Hashimi  showed the similar degree of cleaning efficacy in coronal third and middle third of the root canal. Although the canal was cleaned thoroughly, dentin loss was also seen in the experimental groups and was the least seen in Group A, i.e., hand filing group. Canal enlargement was superior when rotary files were used. Similar results were also obtained by Nazari Moghaddam in 2009. Due to varying taper of the V-Taper rotary files, canal shaping was uniformly conical and the chances of ledge formation were also reduced. P value (<0.05) was found to be highly significant when intra- and inter-group comparison was done. Obturation of the root canal space will prevent the re-entry and growth of microorganisms and traps the traces of leftover pathogens inside the root canal system by a fluid tight seal. It likewise prevents the entrance of bacteria and their by-products from oral cavity and periapical area into obturated root canals, failing which it risks the endodontic treatment achievement. Hence, assessing the quality of root canal filling as the final phase of root canal treatment is essential. For sealing root canal system, the filling must adapt to all parts of the canal. Inadequate obturation of the canal system may result in failure of the endodontic treatment. Root canals which were prepared by rotary files produced a conical pathway allowing effortless entrance of obturating paste and therefore less overfilling or underfilling and diminished odds of voids. Density of filling was found to be better in the hybrid and rotary filing group in comparison with hand filing group. PV was found to be least in hybrid group (3% voids), followed by rotary group (10% voids) and highest in hand filing group (14%). Varieties of rotary systems are accessible commercially, yet one needs to choose prudently considering each canal morphology as one of a kind keeping in mind the end goal to avoid untoward iatrogenic mistakes. According to Peters, an important mechanical objective is to leave as much radicular dentin as possible so as not to weaken the root structure, accordingly preventing vertical fractures. Although no definitive minimal radicular thickness has been established, 0.2 mm is considered critical.,, Further research is needed to confirm and elaborate on its canal transportation, uninstrumented surface area, and preservation of dentin thickness which influences the prognostic stability of the teeth. The young patient and parents will appreciate every minute saved with V-Taper rotary file. The greatest canal enlargement was found in hybrid group > rotary group > hand filing group. The greatest POV was obtained in hand filing group > rotary filing group > hybrid group. The results of the present investigation confirm the superior ability of using hybrid method (rotary files and hand files) for canal preparation and volumetric filling in primary molars. We would like to acknowledge Nidaan Dental Care Private Limited (Dent-CAT). McDonald RE, Avery DR. Dentistry for the Child and Adolescent. 7th ed. St. Louis: Mosby; 2000. p. 401. Cohen S, Hargreaves KM. Pathways of the Pulp. 9th ed. St. Louis: Mosby; 2006. p. 301-11, 842. Yang SF, Rivera EM, Walton RE, Baumgardner KR. Canal debridement: Effectiveness of sodium hypochlorite and calcium hydroxide as medicaments. J Endod 1996;22:521-5. Mohammadzade Akhlaghi N, Khalilak Z, Baradaran Mohajeri L, Sheikholeslami M, Saedi S. Comparison of canal preparation pattern of K3 and ProTaper rotary files in curved resin blocks. Iran Endod J 2008;3:11-6. Nazari Moghaddam K, Mehran M, Farajian Zadeh H. Root canal cleaning efficacy of rotary and hand files instrumentation in primary molars. Iran Endod J 2009;4:53-7. Naseri M, Kangarlou A, Khavid A, Goodini M. Evaluation of the quality of four root canal obturation techniques using micro-computed tomography. Iran Endod J 2013;8:89-93. Hegde J, Bashetty K, Kumar KK, Chikkamallaiah C. Comparative evaluation of the sealing ability of different obturation systems used over apically separated rotary nickel-titanium files: An in vitro study. J Conserv Dent 2013;16:408-12. Ounsi HF, Franciosi G, Paragliola R, Al-Hezaimi K, Salameh Z, Tay FR, et al. Comparison of two techniques for assessing the shaping efficacy of repeatedly used nickel-titanium rotary instruments. J Endod 2011;37:847-50. Danforth RA, Dus I, Mah J. 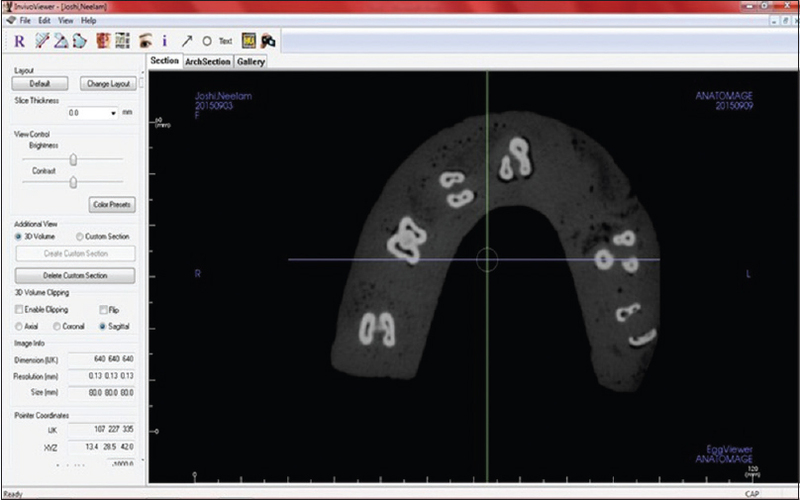 3-D volume imaging for dentistry: A new dimension. J Calif Dent Assoc 2003;31:817-23. Barr ES, Kleier DJ, Barr NV. Use of nickel-titanium rotary files for root canal preparation in primary teeth. Pediatr Dent 2000;22:77-8. Kuo CI, Wang YL, Chang HH, Huang GF. Application of Ni-Ti rotary files for pulpectomy in primary molars. J Dent Sci 2006;1:10-5. Huang QL, Zhang XQ, Deng GZ, Huang SG. SEM evaluation of canal cleanliness following use of ProTaper hand-operated rotary instruments and stainless steel K-files. Chin J Dent Res 2009;12:45-9. Kadhom TH, Hashimi WN. A study to compare the efficiency of different instrumentation systems for cleaning oval-shaped root canals (An in vitro study). J Baghdad Coll Dent 2013;25:49-55. Raghavendra JM, Latha P, Gowda B, Manvikar V, Vijayalaxmi DB, Ponangi KC. Smear layer and debris removal using manual Ni Ti files compared with rotary Protaper Ni Ti files - An in vitro SEM study. J Int Oral Health 2014;6:89-94. Stern S, Patel S, Foschi F, Sherriff M, Mannocci F. Changes in centering and shaping ability using three nickel titanium instrumentation techniques analysed by micro computed tomography (μCT). Int Endod J 2012;45:514-23. Peters OA, Peters CI. Cleaning and shaping of root canal system. Cohen's Pathways of the Pulp. 10th ed. UK: Elsevier; 2011. p. 290-357. Peters OA, Peters CI, Schönenberger K, Barbakow F. ProTaper rotary root canal preparation: Assessment of torque and force in relation to canal anatomy. Int Endod J 2003;36:93-9.